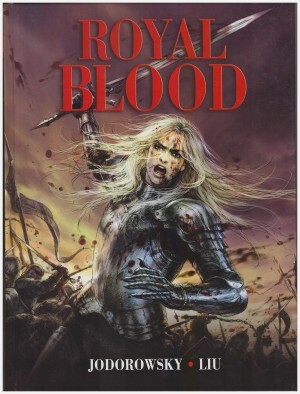 The words “A Game of Thrones prequel graphic novel” are typeset on the cover in a font almost as large as that used for the title. It’s understandable for promotional purposes, but this is very much a case of buyer beware. 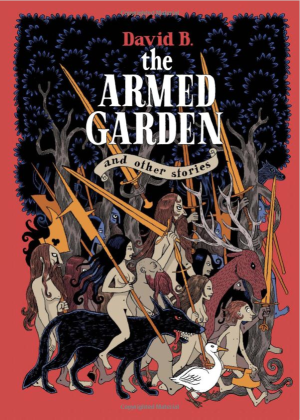 Yes, it also adapts a George R. R. Martin novel set on the same world as his more famous series, but it’s set ninety years before those events. 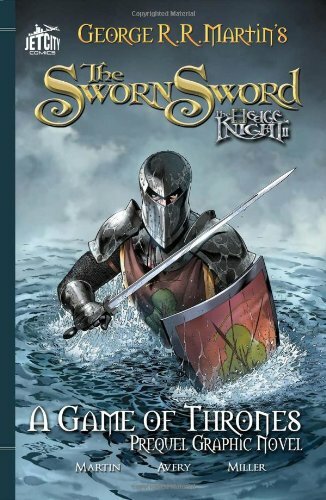 And yes, many familiar family names are dropped with resounding clangs, but as was the case for The Hedge Knight beforehand, this is pretty well straight medieval historical fantasy with a touch of doomed romance thrown in. 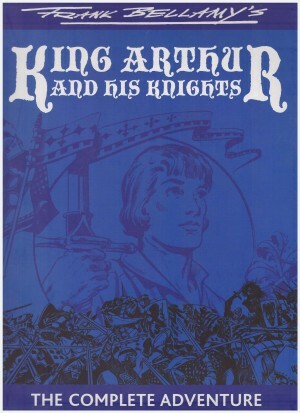 We’ve moved forward two years from The Hedge Knight. Egg is now ten years old, although precocious and knowing way beyond his years, and squiring for Dunk, who’s finding it difficult to shake his former identity of Dunk the Lunk, preferring to be known as Dunk the Tall. 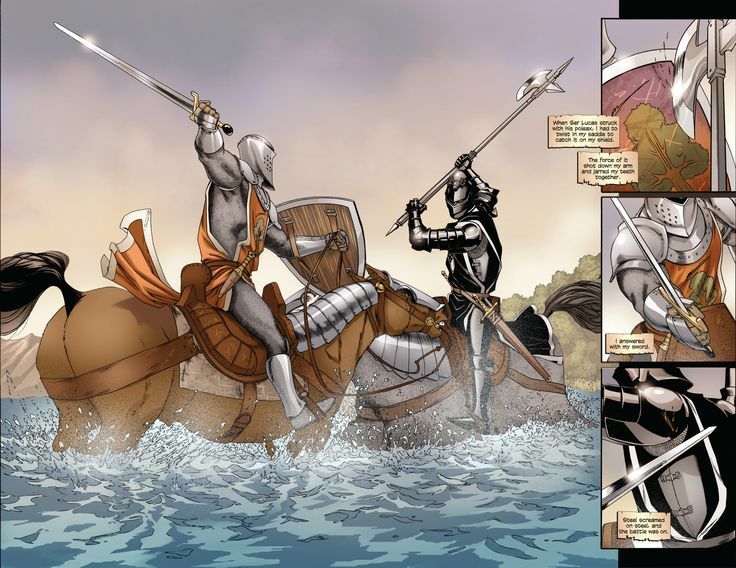 Both he and another knight, Ser Bennis are in the service of Ser Eustace, a man who cuts a tragic figure, having buried two sons and lost a wife. Bennis and Dunk are contrasted, with the former’s ideals nowhere near matching those of the latter. For every reader relishing the dense provision of background material and the rich landscape woven, there will surely equally be another wanting to take a cattle prod to Martin, encouraging him to propel his story forward an iota. It finally sparks into some life around the midway point as Ser Eustace dispatches Dunk and Egg to the castle of Lady Webber in order to discuss why she’s damned the river to prevent water flowing to his land. A myth of fearsome terror has built around the rarely seen Lady Webber, who’s buried four husbands in her lifetime, and was utterly merciless with regard to what was viewed as a previous transgression. After a brief flourish of interest and some collected revelations, we sink back into crawl mode, in a story that lacks the surprises and invention that slightly lifted its predecessor. The one bright spot throughout is the talented Mike S. Miller, whose black and white inked artwork, presented as a bonus, looks far more attractive than the finished pages after colourist Robert Ruffolo has slathered them in shades of brown. Miller characterises the cast in distinctive fashion, and despite a capability for so much more, is disciplined enough to rein in his art to ensure Ben Avery’s wordy transpostion is related in the best fashion. 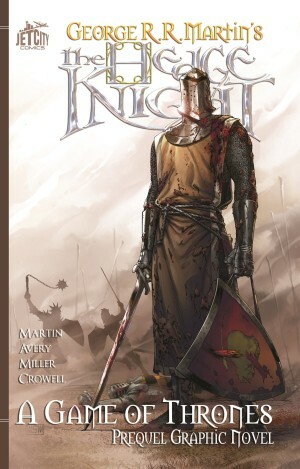 Martin has produced a third novella in the series, The Mystery Knight, and this is also due for graphic novel adaptation.